In my last post, I went over the basic parts of a repeater, and said the parts I selected for our build. I will go into the choices further and give some information about getting the baofeng working with a COR output. The radio I selected was the Baofeng UV-5R. 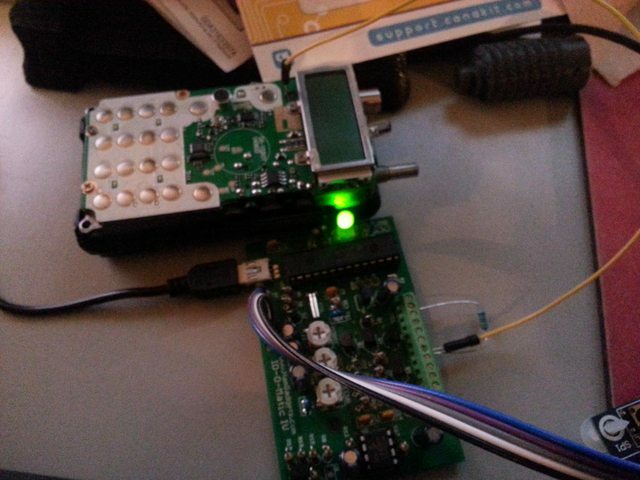 Its schematics are available online, and I found that the radio only lights up its green RX LED circuit when the PL circuit breaks squelch when using tones (unlike other handsets that show receive, even though they don’t break squelch). This seemed like the perfect place to add a link from the hand held to the controller. The transistor shunts the circuit to ground (with the battery on the other side) when a signal comes from the radio’s PIC. So we will have to keep a positive voltage on the COR line with a resistor so that when it shunts to ground, we can have the COR circuit go low when active (ACTIVE-LO polarity on the I/O menu of the ID-O-Matic). So, I took the UV-5R apart (instructions are already on the web, so I will not duplicate them here), and found where the circuit physically is. It is by the PTT button, and wraps around the VFO-MR orange button. You do NOT need to remove the LCD screen for this mod. But you should remove the speaker from the board connections, and the case, so you have room to route the wire out. I drilled a hole in the case on the opposite side (where in front of where the mic/headset plugs are). I soldered it directly to the bottom of the two transistors (the correct circuit in this case). Here is when I was testing the circuit before I added a ground between the two (this will be added permanently when I add my Byonics HTK2P cable that will power the controller, and give me the speaker output all at once). Once I verified that COR was working correctly, I packed it all back into its casing with the cable done in such a way that it could be used in the future. The Baofeng is now modded to be used as a Receiver radio with the ID-O-Matic. Stay tuned for more information on how to build a tunable repeater on the cheap! 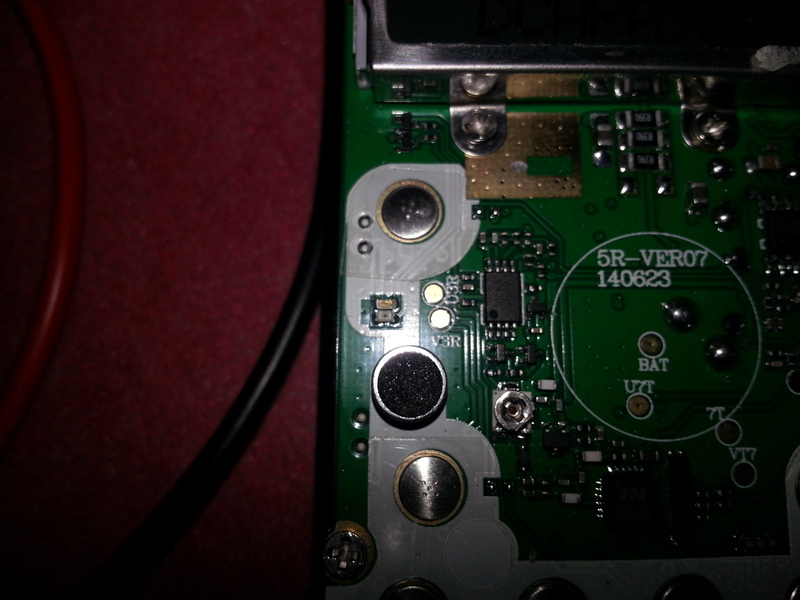 This entry was posted in N5NOM Repeater, Projects and tagged amateur radio, baofeng, d710, repeater on February 22, 2015 by N3BBQ. I recently set off on a small quest of building an inexpensive same band repeater for portable and special uses where there are no current repeater coverage. I wanted something low cost, portable, and tunable without special software. Most people know what Receiver and Transmitters are. This isn’t a repeater that is going to be used much, maybe one weekend a year. Therefore, I decided to use the Baofeng UV-5R I have as the receiver radio since I will not be transmitting with this radio. The Baofeng is what I consider a disposable radio, coming in at under $50 most of the time. For the Controller, I selected the ID-O-Matic IV by Ham Gadgets with the additional Voice Module. This kit cost me $49. It does Time Out Timer (keeps the repeater from being keyed up too long), morse ID, and a voice ID. It has a simple USB (serial) interface to change settings and update firmware. The only problem with it and the baofeng, is that it requires a COR input to know when the receiver is receiving (and to PTT the transmitter), and the baofengs (and most hand helds) do not have this output. Also, some controllers deal with the PL codes. However, we will be using the PL decoder/encoder on our radios, so these can easily be changed in the field. The Transmitting radio is where you would want to spend money. I am using a mobile Kenwood TM-D710G as my transmitter radio. Normally, this radio can do crossband repeating by itself (and even do ID when in this mode), but we are going to just be using 1 side of the radio for this project. Finally, the all important Duplexer. This is the hardest part to come by cheaply. The Duplexer / Cavity filters are important so you can use one antenna between both antennas, but not have the transmitter desensitize the receiver. These need to be tuned, so they only allow the two frequencies you want out of the duplexer for each radio. Cheaper duplexers you can find on Ebay from china can work, but you must make sure they are tuned correctly!. I selected a Chinese made UHF 6cavity duplexer, and requested them to tune it to specific frequencies for me. This included a +5Mhz offset, like normal repeaters use. Of course, there are other things that will need to be looked at, like power, and maybe a GPS unit to supply time to the controller, but those are generally things that you can build / pickup cheap locally and use for other projects too. In Part II, I will be writing about adding the COR circuit to the Baofeng UV-5R, and getting the repeater wired up to the receiver correctly.